DelCor Interactives International was founded in 1995 by Dan Delgado and David Corbin. Dr. Delgado is an optometrist, and Mr. Corbin is an entrepreneur, consultant, and public speaker. Their first product, Status View, was available in 1996. Status View is an education/communication/sales tool for optical professionals, their staff, and their patients. By early 1988 DI was selling over $3 million/year of Status View, and beginning to introduce new products and systems. They received the Bank of Americas Annual Business Enterprise Award for Innovation in January, 1998, in an award ceremony in front of 4500 people, including former Prime Minister Margaret Thatcher, authors Tom Peters, John Naisbitt, Speaker Newt Gingrich, Nobel Prize Poet Maya Angelou, and commentator Larry King, among others. 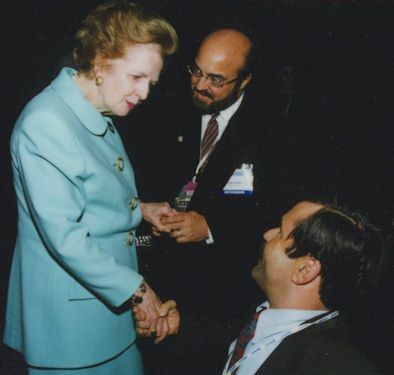 Dr. Delgado (seated) and Mr. Corbin (standing) being congratulated by Margaret Thatcher. She said, "Congratulations on your innovation. Im hoping to see Status View in the UK, because patient communication is so critical today." DelCor Interactives International is a customer-focused company, and owes its success to the combination of technical methods used to develop its products and entrepreneurial experience and intuition that have been used to develop the business. The product concept for Status View started with Dr. Delgados experience in his optometry business. "I wanted to find a way to connect better with my patients, a way that would ask questions, and at the same time, educate them as to potential solutions available to them." Analysis of the customer/supplier chain and optical visit flow chart showed that a complete solution must help the doctor understand the patients needs so that the exam and the prescription can be easily and rapidly customized to the patient, help the patient understand the technical, health, and fashion options available in the rapidly changing optical health field, and help the doctors staff to provide the patient with rapid, complete service. Flow chart of a typical patient visit. During the exam, the doctor had to find out patient life-style information and health concerns, educate the patient about options, and customize and conduct the medical examination, then develop the patients prescription. Dr. Delgado started with the "voices" of his own patients and his own staff, and himself, but knew that if he was to build a business, rather than a personal tool, he would need to get a broader perspective on the voice of the customer. Local professionals in his study club made the first contribution to the development of Status View as a business tool, as well as a technical education tool. Through them, Dr. Delgado and Mr. Corbin were able to visit a wide variety of practices that were all going through the stresses caused by the growth of managed care in medicine. The growth of managed care has caused the doctors to focus much more on the business side of medical practice, and particularly has caused an emphasis on number of patients seen per day, while constraining the amount paid for each procedure. At the same time, the national publicity attendant on the issues of business in medicine has made many patients question the doctors motivations and has endangered or destroyed trust between doctors and patients. Yet the doctor sees him/herself as a medical practitioner first, and a seller of services secondarily or not at all. Many of the doctors use extremely sophisticated equipment as part of their medical work, but some doctors and almost all of their support staff suffered from various degrees of "technophobia," and particularly "computerphobia," induced in part by systems that were sold in the early 1980s as panaceas for the medical practice, and that took tremendous amounts of time away from the medical and business sides of the practice. These observations in the "Gemba" of the optometry and ophthalmology professionals offices lead to some key features of Status View. The interface is easy, intuitive, and can be used by people of all ages and all states of technical knowledge, with a variety of levels of physical ability. Merging: Make operations contiguous or parallel; bring them together in time. Separate the "selling" of features and benefits of various product options from the medical advisory function of the doctor. Local Quality: Make each part of an object function in conditions most suitable for its operation. The patient educates himself at his own pace, at the level of detail that interests him. The TRIZ Technology Forecasting methodology can also be seen at work here. The evolution of all technical systems follows the "S" curve, according to the TRIZ research on the world patent collection (References 4, 5, 6, 7). As shown in Figure 2, the functional capability increases over time, from birth to maturity. TRIZ is unique in its emphasis on functional capability, not secondary results such as sales or market share. Figure 3. The "S" curve for product improvement. A significant overlap between TRIZ and QFD comes with the analysis of the mechanism for the rapid improvement in functional capability in the Growth phase of the concept. Once the product has left the development phase, and is in the hands of real customers, then the customers discover new applications, improvement opportunities, failure modes to be overcome, additional applications, etc. Likewise, the developers are able to merge the data from many customers and improve the product in ways that no individual customer may have anticipated. In the TRIZ analysis, two other curves, for level of innovation and number of innovation, accompany the "S" curve, as shown in Figure 4. Figure 4. The family of curves that show the progress of an innovation. Status View has followed these forecasts, and has used them to anticipate needed changes. For example, recognizing the need to get the Voice of the Customer outside the local area, both Corbin and Delgado were certified to provide continuing education to doctors, and gave talks at state and national conventions of optical professional societies for a year, simultaneously beginning the sales of Status View, but also gathering the voices of the non-customers so that they could modify Status View to include the needs of broad cross-sections of the customer community. In terms of the curves of figure 4, the small number of high level innovations (the customer educates himself in parallel with other activity in the doctors office) was followed by a large number of lower level innovations to improve the utility, speed, and acceptance of the product by the patients and the staff. For example, the initial concept was seen as "self-training" for the doctor and the doctors staff. This uses the TRIZ concept of Principle 25, Self-service, in that as the people use the product, it teaches them what they need to know to use it better and more thoroughly. But, in practice, the level of "technophobia" was so high, that another form of training was needed. For the prototype installations, Corbin and Delgado provided personal guidance which has evolved into a training system with classroom work in a simulated doctors office at DelCor headquarters, a video training system, and a set of handbooks. Numerous other refinements in the way that Status View is actually used in practice were created as a result of feedback from the systems users. The doctors staff members have been very influential in this phase, since they are most sensitive to the use of the doctors time, the patients time, and their own time. The current flow chart for a Status View implementation is shown in Figure 5. Figure 5. Flow chart of a patient visit with Status View. The doctor reads the report on the patients perceptions of needs before beginning the exam, so that she/he can tailor the exam and the patient education to the patients specific needs. The prescription forms prepared by Status View include information on patient preferences from the interview, so that the doctor only needs to add the clinical information. They selected and customized a touch-screen input device, to keep the interview process "friendly" to the non-computer-using, non-keyboard using patient. Status View does not just use a simple set of programmed questions. The question sequencing and logic branching were developed using methods from Gestalt therapy, Ericksonian Hypnosis, Neuro-Linguistic Programming, and other behavioral sciences. Market validation of the Status View concept began immediately, and was seen at 2 levels. Patients purchase an average of $50 additional products/services at each appointment. This has been so well documented that DelCor now offers a complete refund if the practice does not get $35/vist additional purchases in the first year of use. Sales of the system have gone from 0 to over $3 million in less than 2 years. The questions in the Status View interview can be modified if local circumstances show the need, to put more or less emphasis specific areas of education. For example, a geriatric community, an industrial medical practice, and a soccer-crazed youth community need different information on eye safety. Listening to the voice of the customer, recognizing the multiplicity of customers and their multiplicity of needs, and using many skills of innovation to create a system of service to satisfy those needs has taken DelCor from concept to business success in under 3 years. They will continue to expand their use of QFD and TRIZ practices as they move into additional applications of Status View and additional products and services for their customers. E. Domb. "Tutorial on Contradictions." July, 1997, The TRIZ Journal http://www.triz-journal.com and "QFD and TRIZ/TIPS" in the Proceedings of the 3d International QFD Symposium, Linkoping, Sweden, 1997. G. Altshuller, 40 Principles: TRIZ Keys to Technical Innovation, with drawings by Uri Fedoseev, and additional material by Lev Shulyak. Technical Innovation Center, Worcester, MA 01605 USA. Russian version published in 1974, English version in 1998. G. Altshuller. Creativity as an Exact Science. Translated by Anthony Williams. NY. Gordon & Breach Science Publishers, 1988.